A Swedish diplomat once asked me how one can reduce the complexities of international diplomacy to a 140 character tweet. I responded by saying that Twiplomacy must be regarded as an art form, one that uses the language of twitter in order to condense foreign policy initiatives or official statements into short bursts of diplomacy. Without a doubt the most crucial component of twitter’s language is the hashtag. This tweet, which was the first to use the new hashtag G7 (replacing the G8 hashtag), contains all information regarding the intentional community’s response to Russia’s incursion into Crimea. 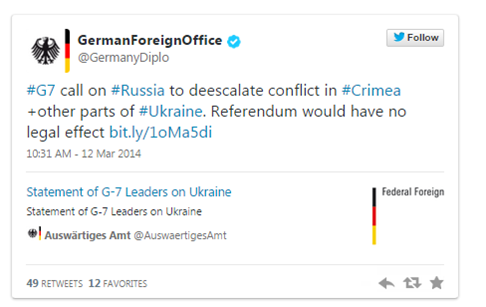 By using the G7 hashtag, Germany’s foreign ministry made it clear that Russia was now expelled from the G8 group. It also indicated that the G7 nations had decided to respond in unison to Russia’s incursion into the Ukraine by imposing economic and political sanctions that would isolate Russia. Understating hashtags, or hashtag literacy, is now a requisite from all those following diplomatic institutions be it scholars, journalists, citizens or even other diplomats. At times, hashtags reveal entire foreign policy initiatives. At other times, they offer followers the ability to understand the image nations attempt to promote around the world through social networks such as twitter and Facebook. For example, over the past several months the UK’s Foreign Office has been using the TimeToAct hashtag in order to promote its global initiative of ending sexual violence in conflicts. This initiative can be seen as an attempt by the UK to distance itself from its involvement in the invasions of Iraq and Afghanistan and the war on terror by re-branding itself as a crusader of human rights. Thus, the TimeToAct hashtag is branding tool used to redefine the UK brand. Similarly, US President Barack Obama recently began using the ActOnClimate hashtag as seen below. As is the case with the UK, America’s global image altered dramatically during the first decade of the 21st century. The US went from being a beacon of democracy to a war mongering empire. But America was also seen as a polluting superpower given its decision not to ratify the Kyoto protocol despite it being the one of the world’s biggest polluters. Thus, the president’s new hashtag may represent an attempt by the US to alter its global image. Interestingly, both the UK and the US’s hashtags include the word “act”. This could be a result of the fact that some view tweets as poor substitutes for concrete policies under the logic of “actions speak louder than words”. By using the word act, these hashtags or branding tools reassure followers that more is to come. Finally, hashtags may also be used by a foreign ministry to portray a foreign country. Such is the case with the tweet below published by the US State Department on the 22nd of March 2014. Internet censorship is #21stCenturyBookBurning and it doesn’t make anyone stronger. Read more on #DipNote at http://t.co/6zswbteEUI. While this tweet does not mention any specific country it was published immediately after a tweet dealing with free speech in Turkey. Thus, it is fair to assume that the US State Department was referring to Turkey’s decision to block twitter. By using the 21stcenturybookburning hashtag, the US may be attempting to evoke images of book burnings orchestrated by the Nazi regime thus associating Turkey’s present with Germany’s dark past. Posted in Uncategorized and tagged Barack Obama, branding, digital diploamcy, hashtag, Nation Branding, twiplomacy, Twitter, UK, USA. Bookmark the permalink.